Ortiz-Colín P, Toledo-Aceves T, López-Barrera F, Gerez-Fernández P (2017). Can traditional selective logging secure tree regeneration in cloud forest?. iForest 10: 369-375. Unplanned selective logging for charcoal and firewood is a common practice in tropical montane cloud forest (TMCF), a high priority ecosystem for biodiversity conservation at the global scale. However, limited information is available regarding the impact of such logging on forest regeneration. We evaluated the abundance and composition of tree regeneration in four TMCF sites subject to traditional selective logging in southern Mexico. At each site, we calculated a tree extraction index based on the number of stumps, logs and charcoal kilns and established six 200 m2 plots where the abundance of adult, sapling and seedling trees were recorded and canopy cover estimated. Based on the extraction index and estimated basal area values, two sites each were classified as being of low (L) and high (H) logging intensity; the extraction index was three times lower in L (7.5 and 9.2) than in H (35 and 35) sites, while basal area was significantly higher in L than in H sites (80.2 ± 10.2 vs. 41.9 ± 4.96 m2 ha-1, respectively). No significant differences were found among sites in terms of canopy cover, diameter and density of adult trees or in the density of saplings and seedlings (0.72 individuals m-2). In all sites, species of intermediate shade-tolerance dominated the regeneration (76%), followed by the shade-tolerant (23%) and pioneer (1%) species. 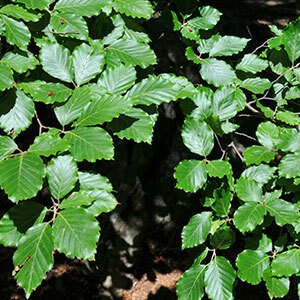 Regeneration of Quercus spp. (four species) dominated at all sites (50.5%); this is a group of particular interest to the local communities because of its utility for firewood and charcoal. The similarity in composition between adult and regenerating tree species was relatively high in all of the sites (Morisita-Horn Index L1=0.86, L2=0.64, H1=0.69 and H2=0.71). These results indicate that, under the evaluated selective logging intensities, TMCF can sustain sufficient regeneration of Quercus spp. and thus presents an opportunity for sustainable management. The legacy effects of traditional selective logging on TMCF tree regeneration are discussed. Regeneration of tree species in Mexican cloud forest. PhD Thesis, University of Edinburgh, Scotland, UK, pp. 199. Assessing sustainability indicators for tropical forests: spatio-temporal heterogeneity, logging intensity, and dung beetle communities. Forest Ecology and Management 253: 56-67. Effects of disturbance intensity on species and functional diversity in a tropical forest. Journal of Ecology 100: 1453-1463. Tropical forest recovery: legacies of human impact and natural disturbances. Perspectives in Plant Ecology, Evolution and Systematics 6: 51-71. The environmental impacts of charcoal production in tropical ecosystems of the world: a synthesis. Energy for Sustainable Development 17: 86-94. EstimateS (Statistical estimation of species richness and shared species from samples). Version 9.1.0 University of Connecticut, CT, Storrs, USA. El bosque mesófilo de montaña en México: Amenazas y oportunidades para su conservación y manejo sustentable. [Cloud forest in Mexico: threats and opportunities for their conservation and sustainable management]. Comisión Nacional para el Conocimiento y Uso de la Biodiversidad (Toledo Aceves T ed), CONABIO, Mexico, pp. 196. Statistical computing, an introduction to data analysis using S-Plus. John Wiley and Sons Ltd, Chichester, UK, pp. 772. Don’t miss the forest for the trees! Evidence for vertical differences in the response of plant diversity to disturbance in a tropical rain forest. Perspectives in Plant Ecology, Evolution and Systematics 16: 279-287. Can harvesting for timber in tropical forest enhance timber tree regeneration? Forest Ecology and Management 314: 26-37. Human impact diminishes seedling species richness in Kakamega Forest, Kenya. Basic and Applied Ecology 9: 383-391. Global Forest Resources Assessment 2015. How are the world’s forests changing? FAO, Rome, Italy, pp. 56. Estructura y composición de la vegetación del bosque de niebla de Copalillos, San Luis Potosí, México. [Structure and composition of cloud forest vegetation in Copalillos, San Luis Potosí, Mexico]. Acta Botánica Mexicana 106: 161-186. Tree composition and structure in disturbed stands with varying dominance by Pinus spp. in the highlands of Chiapas, Mexico. Plant Ecology 162: 259-272. Primary forests are irreplaceable for sustaining tropical biodiversity. Nature 478 (7369): 378-381. Applying succession models to the conservation of tropical montane forest. In: “Biodiversity loss and conservation in fragmented forest landscapes. The forests of montane Mexico and temperate South America”. CABI, Wallingford, Oxfordshire, UK, pp. 200-222. Secondary succession in disturbed Pinus-Quercus forests in the highlands of Chiapas, Mexico. Journal of Vegetation Science 2: 351-360. The red list of mexican cloud forest trees. Fauna and Flora International, Cambridge, UK, pp. 149. Careful partial harvesting in conservation stands and retention of large oaks favour oak regeneration. Biological Conservation 140: 349-358. Experiments for alternative management of forest reserves: effects of partial cutting on stem growth and mortality of large oaks. Canadian Journal of Forest Research 39: 1322-1330. Ecological knowledge of regeneration from seed in neotropical forest trees: Implications for natural forest management. Forest Ecology and Management 112: 87-99. Post-logging acorn production and oak regeneration in a tropical montane forest, Costa Rica. Forest Ecology and Management 167: 285-293. Firewood use, supply, and harvesting impact in cloud forests of central Veracruz, Mexico. Bachelor thesis, Columbia University, New York, NY, USA, pp. 60. Regeneración de los árboles tropicales e implicaciones para el manejo de bosques naturales [Regeneration of tropical trees and implications for the management of natural forests]. Ecosistemas 12 (3): 16. Effects of selective logging on tree species diversity and composition of Bornean tropical rain forests at different spatial scales. Plant Ecology 213: 1413-1424. The ecology and silviculture of oaks. CABI Publishing, Wallingford, Oxford, UK, pp. 600. Successional age and forest structure in a Costa Rican upper montane Quercus forest. Journal of Tropical Ecology 12: 681-698. Reduced abundance of late-successional trees but not of seedlings in heavily compared with lightly logged sites of three East African tropical forests. Journal of Tropical Ecology 26: 533-546. Physiological ecology of natural regeneration of harvested and disturbed forest stands: implications for forest management. Forest Ecology and Managment 158: 195-221. Forest biodiversity assessment in Peruvian Andean Montane cloud forest. Journal of Mountain Science 9: 372-384. Measuring biological diversity. Blackwell Science. Oxford, UK, pp. 256. Impacts of tropical selective logging on carbon storage and tree species richness: A meta-analysis. Forest Ecology and Management 356: 224-233. Regeneration status of important tropical forest tree species in Bolivia: assessment and recommendations. Forest Ecology and Management 124: 263-273. Aims and methods of vegetation ecology. John Wiley and Sons, New York, USA, pp. 547. Dispersal mode, shade tolerance, and phytogeographical affinity of tree species during secondary succession in tropical montane cloud forest. Plant Ecology 213:339-353. Land use/cover changes using Landsat TM/ETM images in a tropical and biodiverse mountainous area of central-eastern Mexico. International Journal of Remote Sensing 29: 71-93. Timber tree regeneration along abandoned logging roads in a tropical Bolivian forest. New Forests 34: 31-40. Anexo 3. In: “Al filo del agua: cogestión de la subcuenca del río Pixquiac, Veracruz”. [At the water’s edge: co-management on the Pixquiac watershed, Veracruz] (Paré L, Gerez P eds). SEMARNAT / INE / Juan Pablos Editores, Mexico, pp. 303-318. Sustaining conservation values in selectively logged tropical forests: the attained and the attainable. Conservation Letters 5: 296-303. Anthropogenic disturbance and tree diversity in montane rain forests in Chiapas, Mexico. Forest Ecology and Management 154: 311-326. Guía para la propagación de especies leñosas nativas de Los Altos y montañas del norte de Chiapas [Guide for propagation of native wood species from Los Altos and Northern mountains of Chiapas]. El Colegio de la Frontera Sur, Chiapas, Mexico, pp. 39. Long-term impacts of fuelwood extraction on a tropical montane cloud forest. Ecosystems 11: 868-881. Setting the stage. In: “Tropical Montane Cloud Forests Science for Conservation and Management” (Bruijnzeel LA, Scatena FN, Hamilton LS eds). Cambridge University Press, Cambridge, UK, pp. 3-13. Disturbing hypotheses in tropical forests. Trends in Ecology and Evolution 18: 18-26. Regeneration of commercial tree species in a logged forest in Selva Maya, Mexico. Forest Ecology and Management 258: 2481-2489. Tropical montane cloud forests: current threats and opportunities for their conservation and sustainable management in Mexico. Journal of Environmental Management 92: 974-981. Tree species richness complementarity, disturbance and fragmentation in a Mexican tropical montane cloud forest. Biodiversity Conservation 11: 1825-1843.